How SMS is Transforming Lives of PLHIV in AfricaIn Kenya, health care professionals are able to stay in touch with individuals living with HIV via new technology. The recent pace of economic growth in sub-Saharan Africa has undeniably been of enormous benefit to the continent. Countries such as Angola, Ghana, Mozambique, and Nigeria have profited from high levels of foreign investment and commodity exports, enabling them to invest in much-needed infrastructure. While this has certainly led to societal transformations, it has also exacerbated the gap between new technologies and old, often defective systems. Much of sub-Saharan Africa continues to be plagued by poor access to electricity, sporadic Internet coverage, and weak governance—none of which is promising for the development of the latest technologies. These obstacles, while challenging, have nevertheless provided fertile ground for innovations using an already widespread technology: the mobile phone. One of the most important advances in mobile technology has been the rapid growth of mobile banking. 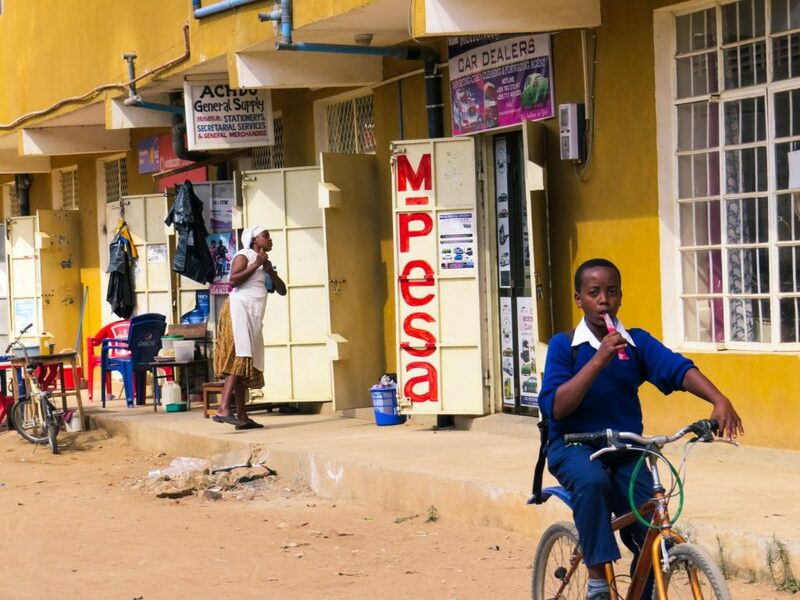 Africa has been and continues to be one of the most un-banked populations in the world. Millions of Africans are paid in cash, have no access to social security or financial services, and don’t pay taxes. Mobile banking works to alleviate this problem by offering individual users a convenient way to make payments at retailers with only a basic mobile phone that uses near field communications (NFC), meaning that no Internet connection is necessary. Likewise, in Kenya, Safaricom pioneered mobile money transfers, enabling individuals to easily transfer money to a friend or relative via SMS. The service, called M-Pesa, has reached millions of people who previously had no access to financial services. Such services, while basic, help to improve security, offer a more flexible way to manage funds, and allow individuals to manage their income in a structured way. Mobile payments also enable consumers to make long-distance purchases, thereby opening retailers up to a diverse body of consumers, irrespective of geography. Since payment is made through a mobile phone, the transactional cost to the retailer is much lower than debit or credit card processing fees. Banks across the continent are also opening their doors to new customers. For instance, in Angola, Banco Angolana de Investimentos (BAI) launched the e-Kwanza, a phone application through which new customers can register and set up their accounts for free. SMS is also becoming an increasingly invaluable tool in the provision of health care services for those living outside of major urban areas. In Kenya, health care professionals are able to stay in touch with individuals living with HIV through the Weltel Project, while in Nigeria, SMS is being used to track the distribution of mosquito nets. Mobile technology is also creating business opportunities for entrepreneurs working to develop new health care solutions. Health insurance is one such industry sector. One of the world’s largest “micro-insurance” companies, MicroEnsure, has built a business through the provision of mobile-based health insurance in collaboration with mobile network providers. The company has offices in Ghana, Kenya, Mozambique, Rwanda, and Tanzania, and provides insurance services to some of the poorest people on the continent—even those living on less than $4 a day. To date, the company has around 4 million customers. It is in the business arena that mobile technology is proving to be especially fruitful from a socio-economic perspective. A recent research paper from Forbes Africa in collaboration with Djembe Communications showed that the vast majority of young Africans (around 80 percent) would rather work for themselves than for an existing company—a prospect made more viable by access to mobile technology. In the agricultural sector, which accounts for roughly 60 percent of the continent’s export revenues, young entrepreneurs are creating new solutions for farming industries. M-Farm delivers real-time market information to farmers, helping them to better understand the true market price of crop supplies, as well as to negotiate more advantageous prices with wholesalers and importers. Other simple mobile phone ideas include iCow, which delivers a breeding calendar for cows’ gestation periods, in addition to providing farmers with advice on the best breeding practices. The mobile phone’s educational capacities aren’t limited to the farming sector. A pilot program in Uganda called MobiLiteracy Uganda uses SMS and audio technology to support home learning, offering daily reading lessons in local languages via the parent’s mobile phone to students who are unable to physically attend classes. Because the lessons are delivered by SMS and audio, illiterate parents are also able to participate. In Kenya a 32-year-old teacher has created a mobile phone-based teaching platform, which acts as a virtual tutor and teacher’s assistant, enabling students to access all of their courses outside of the classroom. It is a for-profit business whose success is based on a high volume of low-cost users. As of November 2015 the service had 500,000 customers. Utilizing existing technology is a smart way for entrepreneurs to create much-needed solutions across Africa. Foreign direct investment and top-down government investment will continue to improve infrastructure, but in the meantime there is money to be made through the most basic mobile phones. Young business leaders across the continent are creating new solutions, but they remain frustrated by poor access to capital, which prevents them from investing in order to expand. Lack of capital is an ongoing issue in Africa, which is why many young businesses look towards foreign investors for help. There are an increasing number of solutions, such as one provided by the pairing service FACRA, a government-backed venture capital fund in Angola. It acts as a conduit between successful Angolan businesses and foreign investors—an introduction that makes it easy for home-grown businesses to source capital from a range of potential suitors. It also provides an easy-access route for foreign firms looking for opportunities in the country, offering cultural and business initiation services and attractive financial terms for direct investment. Organizations such as FACRA are supporting enterprises and making it much easier for growing businesses to find ways of expanding nationally and across borders. It is especially important for mobile-based businesses to succeed because they deliver low-cost solutions that have the potential for high returns, not to mention the socioeconomic benefits they provide to communities. Over the next few years, it is likely that the use of mobile technology—even basic SMS services—will grow. The cost of basic phones has fallen dramatically over recent years and even smartphones are becoming commonplace. Foreign investors now have an opportunity to look at this fast-growing sector as a way of securing long-term gains through businesses that have a strong socio-economic impact, which could provide a win-win scenario for African economies, entrepreneurs, and foreign investors.